Who doesn’t love a beautiful slab of carrara marble? Relative to other natural and engineered stone options, carrara is actually on the less expensive side, so it can be an attractive option for projects in a wide range of budgets. Of course, carrara has its challenges, and isn’t for everyone; it can etch and stain easily. But for those of us who love it, we’re willing to let nature take its course – it builds patina and character. Stylistically, carrara can work equally well in contemporary, transitional, and traditional settings. 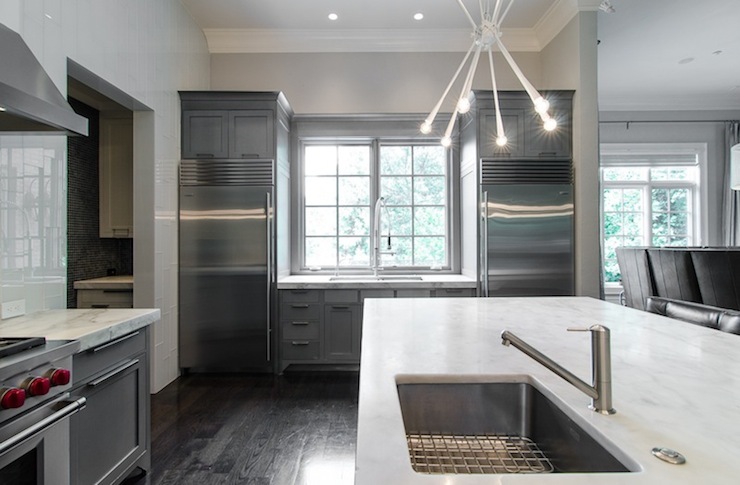 So if you have fallen in love with carrara marble and are determined to use it as a countertop in your kitchen or bath, what should you choose for your cabinetry, hardware, fittings and fixtures? It’s actually a bit trickier than you might think. 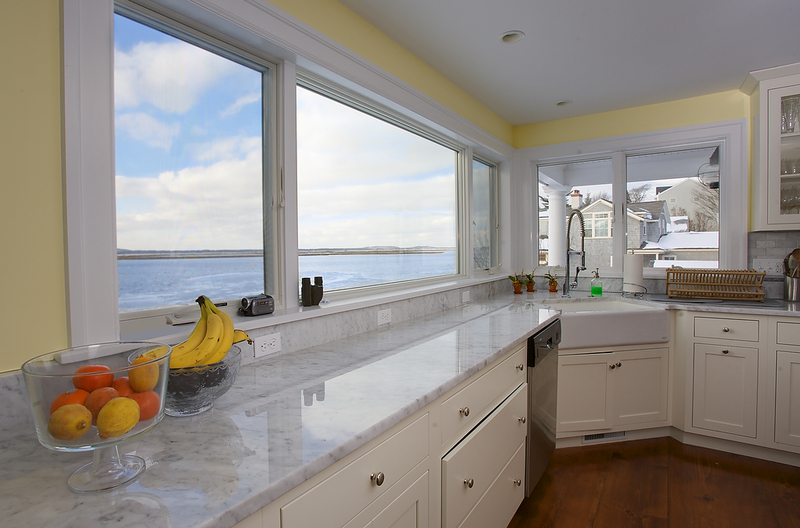 A lot of people look to carrara marble when they’re creating an all-white kitchen. This can be absolutely stunning – IF done right. You have to be really careful about the white you pick for your cabinets, especially if you’re not painting them, in which case you may have 4-5 white options from which to choose. Carrara is a very cool white with cool gray veining, so you can use that to guide your color choice toward a bright white or cool gray with blue undertone for a harmonious look. You’ll want to steer clear of those creamy, warm whites. I see this a lot – including the master bathroom in my own condo (which I did not do, but have not bothered to change). My issue, beyond even the conflicting undertones and color temperatures, is that a warm white makes the cool carrara stone look dingy and less rich. Do you see the difference? The last picture of the large vanity works a bit better than the kitchen because the cabinetry color is repeated in the mirror and wall color. On the other hand, if you are willing to be more adventurous with the color of your cabinetry – perhaps a contrasting color on the lower cabinets or your island – you’ll still be well served to look for cool colors. And I don’t just mean blue, green and purple. There is a cool and a warm side to every hue. Stay on the cool side. A darker color allows carrara to pop the most (if that’s what you want it to do), and makes it look incredibly rich and dreamy. Two of my favorite color pairings with carrara marble are royal blue and emerald green. In my opinion, I think the best metal finishes for carrara marble are chrome (brushed or polished), stainless steel, and brass. Chrome and stainless steel are cool silver finishes that work well with the gray veining in the stone. I have a slight preference for a brushed finish with carrara, but that’s just little ol’ me. And then there’s brass. I know, brass is all warm and golden, but it is timeless, elegant and rich when paired with white marble – especially an antiqued or rubbed/distressed brass – yum! 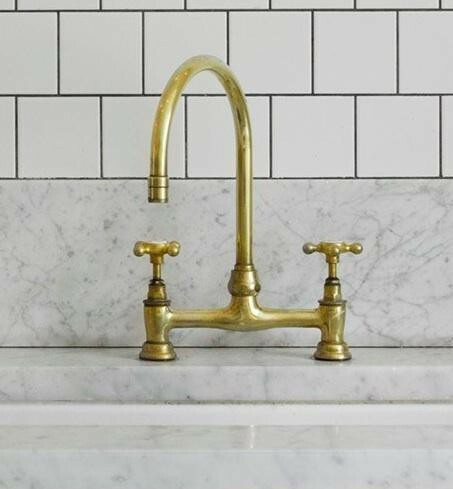 It really helps to balance the coolness of the stone – brass is the yin to carrara’s yang. Nickel can be problematic because it has a yellow undertone and is therefore a warm gray, conflicting with the stone’s cool gray inclusions. See how it doesn’t look quite right – just a little “off” ? Classic clashing of undertones. Oil rubbed bronze – just not a big fan of this combination. Too much contrast with no relationship between the two. 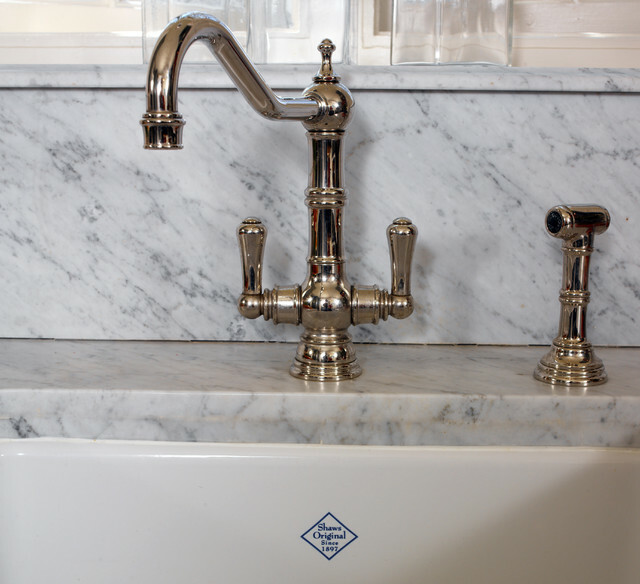 What’s your favorite carrara combination? I’m going to have to go with carrara with emerald green and antique brass! Absolutely love the picture of the first bathroom. The color scheme is perfect. I agree about the cool white as well. It really does bring harmony to the look. Hi there Iris; happy new year to you and thanks for checking in! Agreed on that bath – it is stunning and the designer really knew what they were doing with respect to color; that doesn’t just happen by accident (as I’m sure you know well!). 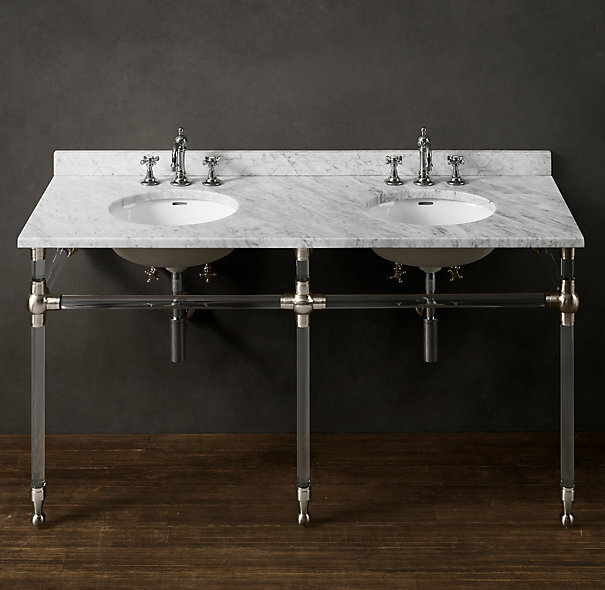 I am in love with how restoration hardware pairs their carrara marbles with weathered oaks – the french empire collection is to die for and on sale…where can I find an extra 10,000 to redo my bathroom? How funny, I just bought the RH French empire night stands for our master bedroom (on sale!). They are lovely. I wish I had some ideas for you on the reno budget – you could use my parents’ strategy when I was a kid – save your dimes in an empty magnum of Moet :). My kitchen cabinets are a bright, pure white. I wanted Vermont Danby Imperial marble because I want a very subtle, relaxed, airy look, not busy. However, in the samples of this marble I received, it seems to have yellow undertones….creamy white…. and when I hold it against the cabinets, it looks dingy and almost a dirty yellow! So, now I do not know if all Vermont Danby Imperial marble will have this yellow undertone, and not look good with my cabinets! Should I start looking at carrara instead? Help! I really love the softer veining in the Imperial Danby, and hope I can find a carrara with the same look! I would suggest a trip to a stone distributor (or two) so you can look at actual slabs. Sample squares of natural stone are not necessarily representative of the slab you will get, even if they come from the slab itself. This is especially true of highly veined marbles. You may find a Vermont Danby slab that works. Carrara is so widely available, there’s a good chance you could find a slab that has the level of veining you’re looking for. Other white marbles to look at: Calacatta Gold (may have yellow veining, and tends to be a bit warmer), Statuary (similar to Carrara). Stay on the cool side with those bright white cabinets. Good luck! Dale, use a quartz product that looks like white marble. It’s more expensive, but doesn’t stain or etch, as Kelly has said, and with quartz, because it’s man made, you know what you’re going to get. Brass does look good with “white marble” but chrome looks good also and is easier to keep looking nice. However, little brass used with stainless steel looks like “you know what you’re doing”. 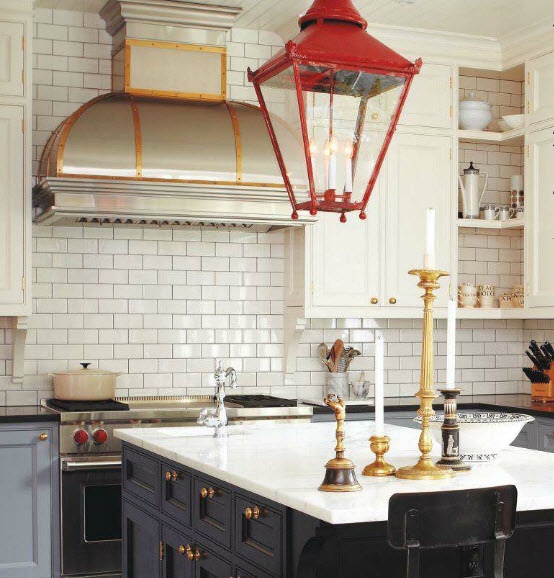 The hood over the stove is good place to add some brass trim, especially if the hood is fabricated to order. If you ever get a chance to go through the kitchen of the French Laundry, you’ll see what I mean. it’s awesome. Hi Kelly……Thanks, so much for your reply. I am going to bring my cabinet door sample with me when I look at slabs. I am disappointed, as I really love the honed Imperial Vermont Danby soft and subtle look, but the creamy color against my bright white cabinets just look so dingy! I think I will also bring the 4 x 4 samples, so I can compare them to the slab…..maybe I will find a Danby that is more white than the samples I have. I did seal the samples, again….maybe the sealer imparted a yellow tinge to them……All I know for sure is, the Carrara with its cooler white looked much better against my white cabinets! 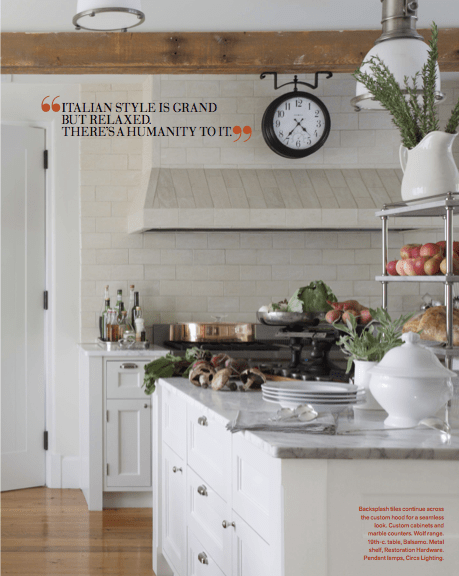 Love the Calacatta…..but my home is a beach cottage……wide pine plank floors, one wall of the kitchen a hall are also 10″ pine planks…..and I just think the Calacatta may be a bit too much! Do love it, though! I really love the choices here! I would choose Cambria. Now I will say, we have granite and it’s been great! I love the last photo of the granite, if you do go that route. It’s so easy to clean, looks new all the time. I don’t know a whole lot about counter tops but those are my two choices! http://www.forevermarble.com/. Wish I knew what paint the white in the grey and white bathroom is. It looks perfect. I definitely want white, but I don’t want it to be too too crazy cool and bright. That one is gorgeous. Whites are very tough to get right – I wish you luck! 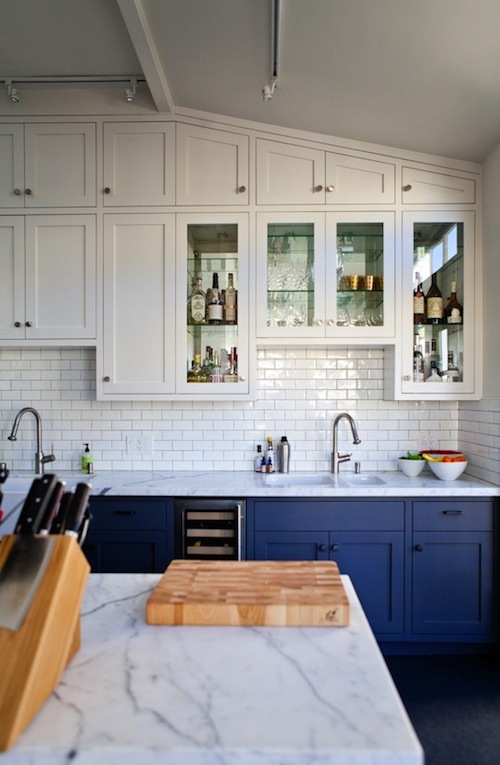 I’m looking for Carrara Mable top side 24″by 72″ for my counter top , how do I order it and how much us cost ? 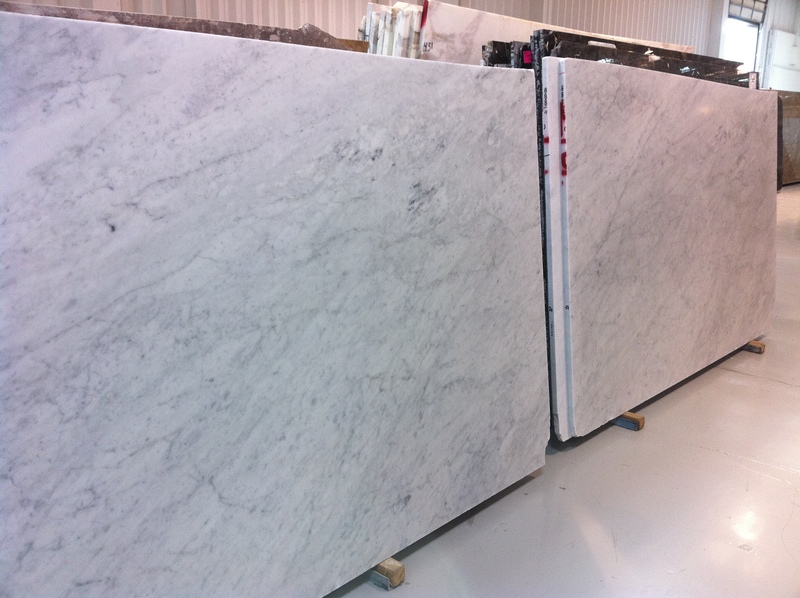 You have to visit warehouses that have slabs of marble and choose one you like. I guess you could just order it from one of the large box stores, but the sample you are looking at in the store, will be nothing like the countertop they bring to your house to install. So, it is best to find your own slab and then you know exactly what you are getting. What’s your opinion of carrara mixed with wood tones? Was thinking a walnut or something a bit lighter – something the colour of well-worn pine. Would this work, even though the wood is warm and the carrara, cool? I like to see more neutral wood tones with Carrara – so, not too yellow or orange-y, not too red. Walnut could work quite nicely, depending on the stain, but I’m not so sure about pine. Look to old Victorian marble top tables for inspiration (lots at antique shops, flea markets and on eBay and Craigslist. I am doing the same. Carera counters with water sawn oak floors. Would like to hear feedback as well. What did you end up doing, Jodie? I like wood with marble…think it looks timeless and the wood warms the marble up. But I don’t like the current white and gray craze, so I realize many would not agree. I think it would be gorgeous! But,…..I would look for pictures of kitchens with this combination and I would also bring a good size piece of the pine I would be using and see what it looks like against the marble slab I would be getting! You have some big decisions to make, and I certainly understand the stress involved in doing so! I don’t feel comfortable giving you an opinion on this without understanding the full context (including the color of your walls, any backsplash tile you are planning to use, undertones in your wood floors and cabinetry, etc.). It’s potentially a complicated answer :). This really falls into the realm of a virtual color consultation – if you’d like to learn more, please contact me here: http://kellyrogersinteriors.com/contact. Hi Kelly: thank you for your response. you’re right – it is complicated! unfortunately i had to make decisions quickly so i’m crossing my fingers. I’m in the same boat as Lynn. I’ve installed carerra countertops with a medium grey subway tile backsplash on my existing “mahogany” stained cabinets. I plan to paint the island, but I’m hesitant about going grey on the walls AND island. Trying for a combination of warm/cool. Any suggestions? I’d love to know how Lynn’s turned out. Hi Leigh! The situation you are describing does not lend itself well to a simple answer. The mahogany cabinets might look like an anomaly if everything else is gray. And combining different grays requires great care with respect to value (light/dark), temperature (warm/cool), and especially undertone (blue/red/green). When it comes to specific colors or materials, I generally don’t provide recommendations in this forum, especially since I don’t have the full context for your color dilemma. If you are interested, I do offer virtual color consultations – you can inquire at my website, kellyrogersinteriors.com. Thanks, and good luck to you! Thank you for the great article! It was exactly the info I was looking for. I had a large marble island installed and realized that it does not work with our warm honey tone hardwood floors. Not sure how to solve this problem but I am hoping that the right paint will help. I’m glad it helped, Cheri! You are on the right track – finding the right paint color that relates to both surfaces will help to “bridge” the gap. Good luck to you! I don’t know what to do with the other countertops! I hate black granite. Any ideas? Thank You! Your blog could not have been more helpful. I have chosen a honed Carrara slab for my bathroom vanity and a ceiling height cabinet counter, as well as Carrara tiles for the shower and floor. I am considering having the vanity and cabinet painted in Benjamin Moore Tundra or Heaven with the walls painted in BM Dior Gray or Sea Life. The paint chips against the marble looked lovely. Am I getting it right? Also, do you think a matte finish or some type of satin for a sheen to the cabinetry would be most appropriate? Our bathroom is very similar to the first picture. Carrera basket weave floor, gray walls, shaker vanity. Because of the size we had difficulty finding the exact vanity we wanted…..it only came in bamboo. When it arrived, I loved it and want to find some way to incorporate it into this white and gray bathroom. Also the vanity top is black granite, brushed nickel hardware and the shower is white beveled subway tile. Any ideas? To make this work, I would suggest incorporating the light yellow tones of bamboo elsewhere in your bathroom, to balance out the composition and to prevent the vanity for looking like the odd man out. For example, in picture frames, bath accessories on the vanity, etc. good luck! This is such a helpful article. I learnt something useful after reading it, so glad you wrote this. Thank you so much! Hi Kelly, I am hoping that you can help me. I am building a new home and have got the carrara grey polished tiles for the floors and walls to the ceiling so the tile will be throughout both the bathroom and ensuite (which I love so very much) for my main bathroom and ensuite. I want a POP/WOW factor to my bathroom/ensuite and was wanting to put in a dark oak woodgrain vanity in both rooms. Will this colour scheme work or should I be going for a different colour for my vanities to go with my tiles? Please help, many thanks Lisa. Sorry for the delay in responding – I just saw this notification. My feeling is that a dark wood vanity treatment with a very white/light gray bathroom could either look bold and beautiful, or be too heavy/unbalanced. It really depends on the size, layout, etc. If you do the wood, make sure you repeat it somewhere else (e.g. picture frames on the wall) to make it look pulled together. Good luck! I love this marble, do you think it is ok to put it with cream colored distressed cabinets with gray undertones? Hi Kelly! Great article…Do you know what the name of the paint color used in 2.) Hardware, Fixture and Fitting Finishes? Its the paint color in the kitchen…thanks! Beautiful pics. And interesting article. 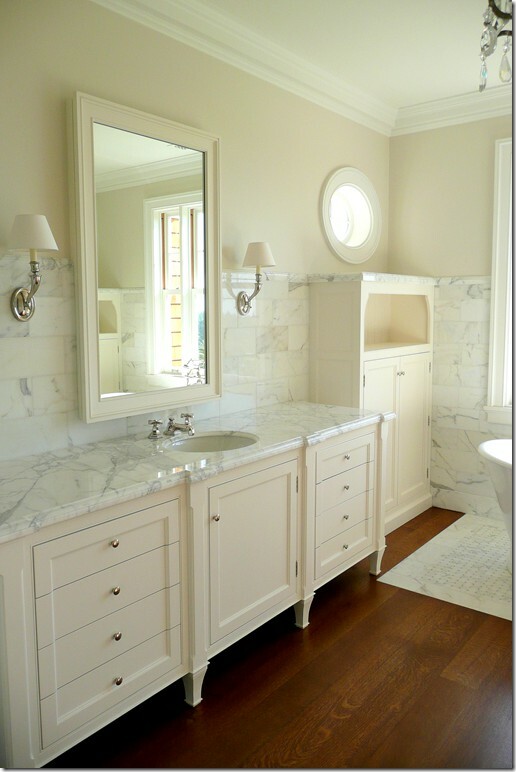 What do you think of Benjamin Moore Pure White to be used in a bathroom with a white vanity with Carrera marble top? Has anyone used extra white Sherwin Williams for the cabinets with their Carrera marble in the kitchen? It is a plain bright white with no pigment. I am also concerned as mentioned below with the clashing of the painted cabinets and cool marble counter top and want to make the right choice. 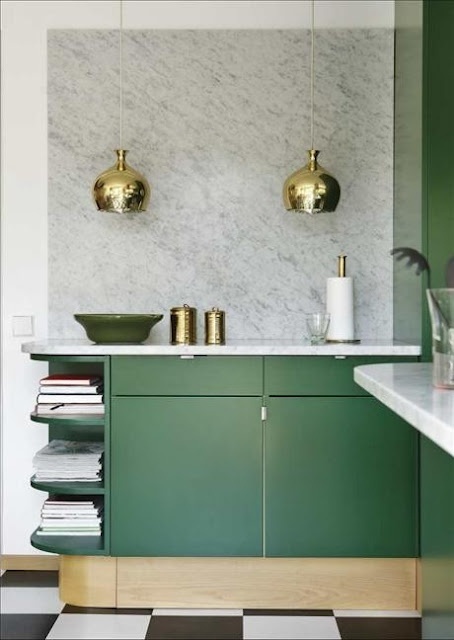 I totally agree that green would look great with the carrera marble. Can you recommend an emerald green? I’ve always wanted to use that color but haven’t found the right one! Any suggestions?